Nearly every Christian on TV and in movies is portrayed to be an extreme bigot, a closet prodigal, or a gun-toting uptight neo-con Republican. A good screenwriter can manage to squeeze all three in one. Christians do deserve some of the criticism. In the 1980s, we over-reached our grasp by trying to politicize “Christian morality” in every platform, and we now live in the backlash of trying too hard to force the church into the state. 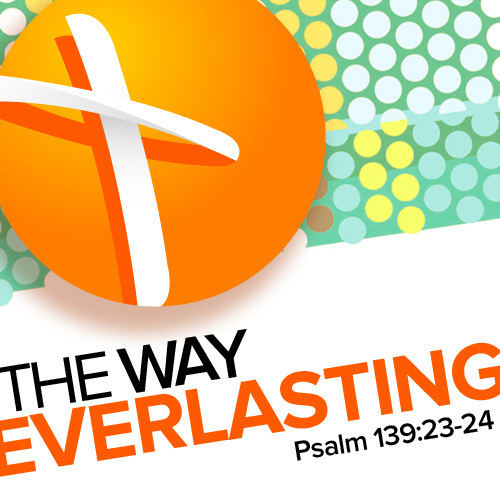 In the 1990s, there was a “Christianese” version of everything, from Testa-Mints to Bibleman to Xtreme Youth Group Pizza Night to the Holy Land Experience theme park. Either we’re getting good stuff like Lecrae and Switchfoot, or we’re getting awful stuff like a tame Nic Cage in Left Behind and yet another Westboro picketing. For every time that Christians call foul on how they’re portrayed in the media, I always have to say that we’re not helping our case either. It’s true that the media sensationalizes the worst of us: but we’re giving them great material. So it always surprises me to see a multi-dimensional Christian in the entertainment media, who’s not a dichotomous banner-waver but a modest down-to-earth father, who happens to be a Christian. Hershel from The Walking Dead has some of the familiar tropes we’ve come to expect — a sage-like advice dispenser, has too-perfect Bible verses for the situation, owns an actual farm — but there’s a deep world-weariness and bemusement in his mannerisms that brings a depth we never see in screen-written Christians. On a show that’s been panned for uneven writing, false motivations, and some bad dialogue (Things-And-Stuff Rick), Hershel’s character arc is one of the best on the show, and one of the best in any show period. Here are five reasons why Hershel Greene is my favorite Christian on TV. 1) He wasn’t a stereotype, but a fully fleshed out character. When Hershel first showed up onscreen, I was ready for all the eye-rolling bigotry to spill out his mouth. At some point, his faith would have to be portrayed as an obsolete obstacle, or he would die from his own faithful foolishness. At the time, the showrunner of The Walking Dead was Frank Darabont, who directed The Mist, which had the most unbelievable zealous Crazy-Christian ever. 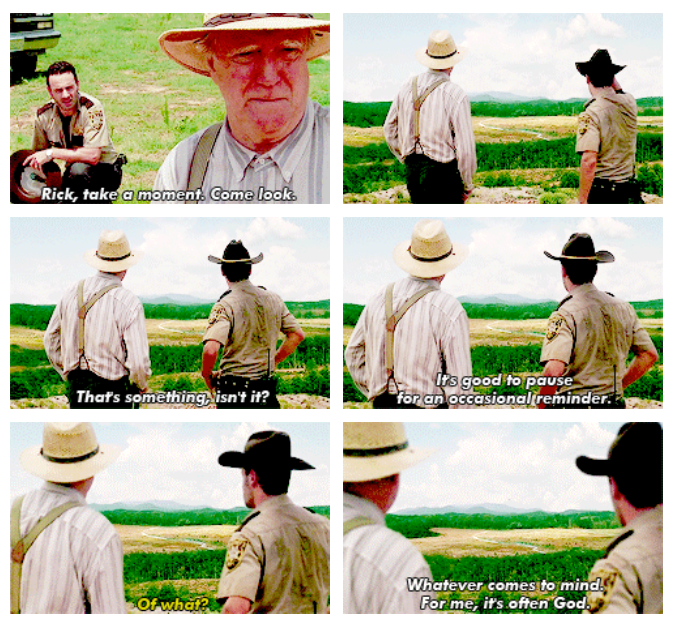 I figured Hershel would be a talking point to show why religion equals evil, as usual. I kept waiting for the other shoe to drop: but it never happened. 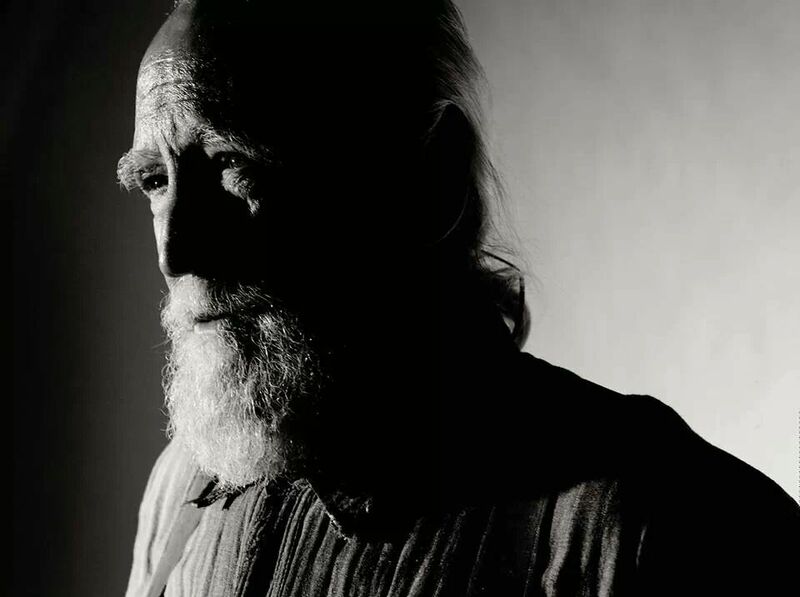 Hershel was a family man, a simple farmer, a devoted father, and mostly kept his sanity in a post-apocalyptic world. He fought for his survival and the dignity of others, just like everyone else. He reluctantly agreed to let in a group of strangers into his home, at the potential cost of bringing danger, and though he continually tried to push them out, still let them stay. It’s the same exact conflict you and I would have in the same situation. For once, a Christian was a human being on network TV. Alcoholism is also usually conveyed with a lot of non-subtle cues on TV shows, most especially with Shane drinking a bottle of liquor in the shower. Scenes like that immediately take you out of the fictional world because you know it’s only done for the visual. A better written screenplay shows a history in the proceedings, like when best friends or the married couple have inside-jokes, or when the dialogue is less about exposition and more just two guys talking. It doesn’t feel like the actors just met on set that day, but there’s a realism and relatability. When an actor can show that certain character flaws have always been there, pulsing beneath the surface, this is what brings the particular world to life. And Hershel puts on his A-game at the scene in the bar in “Triggerfinger.” The lines of struggle truly show in his face, and we can buy into Hershel as a real whole person. 2) He was one of the most resourceful characters on the show. Hershel’s former occupation was a veterinarian, and in most dystopian media, that instantly means you’re the doctor for the humans too. Yet Hershel made this believable, by both honing his craft (eventually teaching basic surgery to Carol) and knowing his limitations. When the infection catches on at the prison, he becomes the most valuable person there. And a farmer? Growing your own food? Raising livestock? Sounds like it could come in handy in a world where grocery stores only contain rotting food with rotting corpses that want to kill you. This easily brings Hershel to over 9000. 3) He didn’t have a perfect faith. Under the pressure of this kind of world, Christians on TV are usually shown as ridiculously chipper and upbeat, or they throw their faith out the window. At the start of “Internment,” the most Hershel-centric episode of the series, he’s shown reading his Bible while treating sick patients — but by the end, after having seen a close friend die and nearly dying himself, he opens the Bible only to weep alone. Some viewers have said this is the moment he lost his faith. Others say this was a clear statement that faith can no longer be upheld in such a cruel world. I disagree. I tend to think that this is the norm for Christians, wondering how God fits into our everyday grind of rush hour traffic, hospital bills, and family drama. It’s okay for Christians — for everyone else, really — to weep, to vent, to be frustrated, to be dangerously honest. Look no further than the Psalms, than Jeremiah and Isaiah and Ruth, to see the raw openness of doubts, detachment, and disappointment in God and with themselves. Faith is not easy because life is not easy. Hershel weeping over an open Bible shows that vulnerable space between a fallen hostile world and a perfectly loving God, where we live in a grey unresolved tension. It was a perfect image of our imperfection. 4) He was very often the voice of reason and hope. 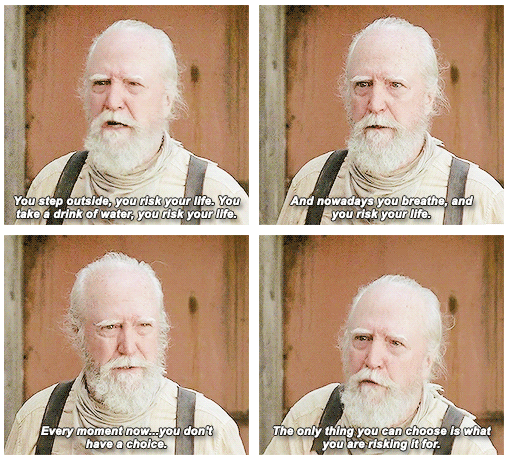 The “hopeful” characters on TV can be a bit shrill and grating, and though Hershel had his handful of corny pep-talk, he also had a bunch of great quotables that didn’t ignore what was happening, but made the most of it. I also have to add: his complete acceptance of Glenn as a son-in-law was a win for race and family. 5) He believed in the good of humanity until the very end. The Walking Dead and other zombie literature always asks the question: What would we do if we were in the that world? Would we do whatever it takes to survive? Or does surviving at all costs essentially kill our humanity? Are we more like Rick, or Shane? Are we more like the Governor, or Michonne? If you must do unspeakable things to stay ahead of others, is that really ahead of anything? Hershel Greene remained consistently on the pro-human side of the zombie landscape. While Rick was fluctuating between crumbling insanity and Alpha male leader, and Shane was corrupted beyond recognition, we have one character who continually believed in the good of people. In his last scene with the Governor, perhaps the most detestable antagonist of the show, Hershel says, “Your people, our people, we can find away to live together … Everything you said, the way you’ve said it, you’ve changed.” Hershel really believes that a mustache-twirling villain like the Governor can still do some good. These very words could have come out of Hershel’s mouth. When Hershel sees this newfound spark in Rick, he can’t help but sense a better victory has been won. Hershel has imparted just enough of his wisdom, his grace, and his heart, to see a broken man become healed and empowered. 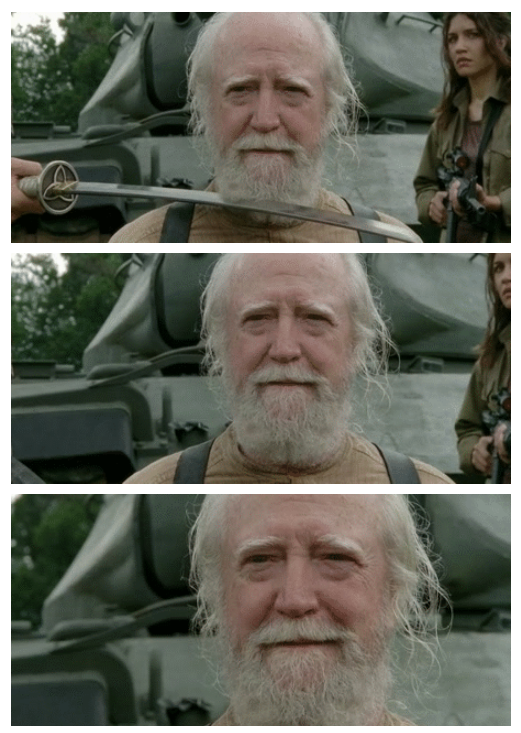 And for that, Hershel could die happy. There went the finest Christian on TV, on his own terms. Hats off to the writers of The Walking Dead and to Scott Wilson, for an excellent performance, and for treating the Christian faith with a grounded, nuanced reverence. Purchase my new book on Amazon ! Posted on October 7, 2014 October 17, 2014 by JS ParkPosted in Books, Christianity, Church, Culture, Current Events, Film, Life, Literature, Ministry, Movies, News, Philosophy, Photos, Pictures, Psychology, Relationships, Religion, TheologyTagged AMC, The Walking Dead, TWD. Previous Previous post: What About The Tough Scary Things That Jesus Said? Next Next post: Does God Love Even The People Who Choose Against Him? Thank you for this. Someone finally pointed it out.